We have been discussing some issues that are vital (in energetic terms) both for your body and for your home. To name a few: Feng Shui, the importance of maintaining the Chi energy flowing, the bagua areas and ways to clear bad energies. Let’s not forget the moon and how its phases affect our behavior, personality, mood, attitudes, spiritual (and physical) energies. We mention this because, when the subject is to attract money with salt, there are some considerations that have to be made first, even to understand how all this subjects are related. Salt is so present in our day-to-day life that sometimes we forget that it is a powerful element and can be used as an ally in our life. For example, salt crystals can emit electromagnetic waves that absorb bad energies (and have the power to destroy them). Also, and due to its negative ions, sea salt helps to stimulate negative Chi to move on and help attracting the good kind of Chi. It is precisely on this subject we would like to share some ideas with you. If your purpose is to attract money with salt, you have to necessarily use sea salt. Please, don’t use table salt because it doesn’t have the same purifying properties. So, which are the procedures you have to take into consideration? You can find sea salt at your local grocery store. Buy a few bags and keep in mind that sea salt attracts abundance but it needs to be abundant in our house too. 1. Put a hand full of sea salt on the center and back side of your entrance door. This will bring you wealth and attract good Chi into your home. This ritual also helps to attract abundance to all of those who enter into your house. 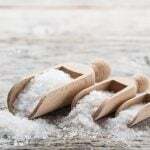 Don’t forget to replace the salt every 10 days to ensure its purifying properties. 2. Wrap in plastic or in a small bag a teaspoon of sea salt and put it in your wallet in a secret compartment. This is said to be a powerful way to attract money with salt. The 10 days rule also applies here. 3. If you are having difficulties in managing your finances put sea salt in all the corners of your house. You can use discrete plastic containers. It’s important to cover them. This ritual will help you to absorb any negative energy you house may be harboring. Again, change the salt every 10 days. The best time to do any of this rituals is on the first day of the New Moon. Keep in mind that this phase is special because it marks new beginnings. As it’s the best time to renewal and creation, as well as to replace all the energies around you, be sure that you choose one of the rituals to attract money with salt on this particular day. The chances of success are much higher than any other day.